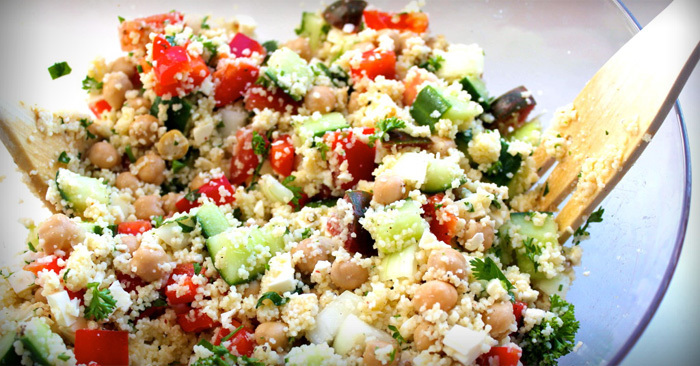 Perfectly round out your dinner, or pack the perfect healthy lunch with this simple couscous salad recipe. These refreshing and tasty flavors are sure to please! 1. Bring vegetable stock to a boil in a sauce pan. 2. Remove water from heat. 3. Immediately pour uncooked couscous into the pan, and stir to evenly distribute. 4. Cover, then leave for 10 mins, until fluffy and all the stock has been absorbed. 5. Meanwhile, slice the onions and peppers and dice the cucumber. 6. Gently fold these vegetables into the couscous. 7. Fork through pesto, and crumble in feta cheese. 8. Sprinkle over pine nuts and serve. Go ahead, put some bell peppers into your shopping basket, and start reaping their amazing health benefits! Unlike some peppers, bell peppers are mild and can perfectly enhance a salad or meal (and they taste fantastic solo -- raw or when roasted). •	Red bell peppers contain several phytochemicals and carotenoids, particularly beta-carotene, which provide abundant antioxidant and anti-inflammatory benefits. • The capsaicin found in bell peppers helps control diabetes, reduces bad cholesterol, and eases inflammation. • Bell peppers contain vitamin B6, which is helps renew cells and is essential for the health of the nervous system. •	Bell peppers contain plenty of vitamin C, which powers up your immune system and keeps skin youthful. The highest amount of Vitamin C in a bell pepper is concentrated in the red variety. •	If cooked for a short period on low heat, bell peppers retain most of their sweet, almost fruity flavor and flavonoid content, also a powerful nutrient. •	Bell peppers are low in calories; Even if you eat one full cup of them, there would be only 45 calories. And remember, that one cup will give you more than your daily quota of Vitamin A and C.
•	The sulfur content in bell peppers makes them play a protective role in certain types of cancers. •	Certain enzymes in bell peppers, such as lutein, protect the eyes from cataracts and macular degeneration later in life.